The City’s Solid Waste Management Services Division, in partnership with Enbridge Gas Distribution Inc., will begin installing new equipment at the Dufferin Solid Waste Management Facility later this year. The new equipment, known as a Bio-methane Upgrading System, will allow the City and Enbridge to turn the raw biogas – produced from processing Green Bin organics – into renewable natural gas (RNG). This biogas upgrading project is paving the way for future renewable natural gas projects within the City and throughout Canada and North America. Through multiple studies, the City also identified RNG production opportunities at two landfill sites and its other anaerobic digestion facility. Once all four RNG sites are up and running, estimates suggest that the City will be able to produce approximately 65 million cubic metres of RNG per year – the equivalent in greenhouse gas emission reductions of taking 35,000 cars off the road annually. The City of Toronto’s existing and closed landfill sites and anaerobic digestion (organics processing) facilities are some of the largest producers of biogas and landfill gas in Ontario. Over the last few years, the City’s Solid Waste Management Services Division has been looking for opportunities to harness the green energy potential of these gases. In 2015, the Division identified renewable natural gas (RNG) as a top priority for biogas management and started to search for technologies and partnerships to upgrade its biogas and landfill gas to RNG. When looking at the different technologies and options for upgrading and transporting the gas, the Division took a triple-bottom-line approach that considered the economic, social and environmental benefits for the City of Toronto. The City has been working with Enbridge to create and realize the vision for the project at the Dufferin Solid Waste Management Facility and is partnering with the organization on the design and construction of the facility as well as its operation and maintenance for the first 15 years. The project uses a closed-loop approach in which organics collection trucks are ultimately powered by the waste product they collect. This advances the Division’s mandate to be an international leader in sustainable solid waste management and supports the City’s move towards achieving a circular economy. While chemically identical to traditional natural gas, RNG is a renewable resource that can be produced using materials that are readily accessible through the City’s Green Bin organics program. RNG is also less expensive and more environmentally friendly than fossil fuels such as diesel. Once injected into the natural gas pipeline, it can be used to fuel vehicles or provide electricity or heat to homes and businesses. RNG generated from food waste is actually considered carbon negative, because the reduction in emissions by not extracting and burning petroleum-based fuel, and the emissions avoided by not sending organics to landfill, exceed the direct emissions associated with the production and use of RNG. Each year, the City diverts over 120,000 tonnes of organic material away from landfill through its Green Bin Organics program. The City has two state-of-the-art organics processing facilities – Disco Road and Dufferin – that use innovative pre-processing and anaerobic digestion technology to break down organic material. The Dufferin Organics Processing Facility is one of the first full-scale anaerobic digestion facilities to operate in North America and is just finishing an expansion to increase its processing capacity from 25,000 to 55,000 tonnes of organic material per year. Once at an organics processing facility, Green Bin material is unloaded onto a tipping floor. From there it is pre-processed to remove the plastic bags and contaminant materials from the organics. The remaining material is sent to anaerobic digesters, where micro-organisms in an oxygen-free (anaerobic) environment break down the material to produce digester solids (which can be used to create high-quality compost) and biogas. Both biogas and landfill gas can be upgraded to create renewable natural gas (RNG). The biogas produced through anaerobic digestion is made up primarily of methane, but also includes carbon dioxide, oxygen, nitrogen, water, sulphur and various non-methane organic compounds. Biogas upgrading involves purifying the gas to remove carbon dioxide and other contaminants. The result is a gas that is more than 90-per-cent methane and can be injected directly into natural gas pipelines. 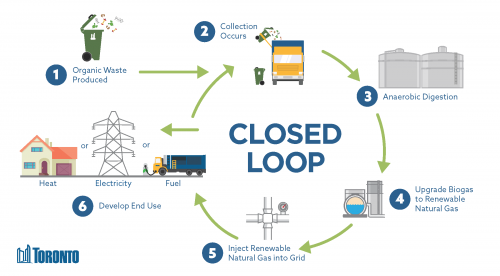 Biogas at the City’s anaerobic digestion facilities is currently flared (burned), which is common industry practice for managing biogas, but does not take advantage of its renewable energy potential.